16th August 2010Jason Mckeown on How much should we analyse City’s uninspiring win over Stevenage? In which Jason reflects on news Michael Boulding is to take a pay cut to stay and looks at what he needs to do to make a bigger impression. 29th October 2008Michael Wood on Whatever happened to Plan B? In which Michael looks back at how Stuart McCall has moved on from Plan B and BarryBooGate back to the top of the table. In which Luke watches ten minutes that turn everything around as City come back from two down to beat Accrington Stanley. It goes against how I believe any football manager should be treated – I know they should get, and deserve, far more time than this – and his predecessors have received greater support and commitment from me in similar circumstances. I don’t want Peter Taylor to be our manager anymore. Two straight defeats have undone the excellent work of beginning the year with back-to-back wins. City have twice climbed to the cusp of the play offs this season, on both occasions after they had beaten Bury 1-0. However a lack of consistency and the hindrance of starting the campaign so badly leaves the team seemingly unable to take that next step and elevate themselves from play off hopefuls to play off contenders. It just doesn’t look like it’s going to happen this year. And I can live with that, really I can. Years of disappointment mean you have to learn to accept failure or find something else other than Bradford City to care about. So I don’t believe Taylor should leave Valley Parade because he is failing to deliver success in his first full season – in time I think he would get this club promoted, just look at his track record – it’s something deeper than that. I’m sick and fed up of the horrible style of football we’re enduring under Taylor. I didn’t go to Oxford, so I’m not in a position to criticise the 13th league defeat of the season. But listening to Derm Tanner and Mike Harrison commentating on the game for Radio Leeds, a feeling of embarrassment and despair grew inside me that I can no longer dismiss. It was obvious that, once again, City possessed no greater ambition than to defend deep and nick a goal. Indeed Taylor’s post-match interview admission that he’d played Omar Daley and Mark Cullen up front so the team could counter-attack – rather than speaking of a more positive game plan – was depressingly familiar. We’ve played this way so often this campaign. And his approach is unlikely to change. In October and November we saw City playing some excellent football, but when a few close games subsequently went against us the attacking style that had turned around the campaign was reined back again. Entertainment and excitement has been largely lacking all season. That matters a great deal to me. Don’t get me wrong, I am desperate for my football club to achieve promotion and to escape this division. I want us to climb back up the leagues and, ultimately, re-establish ourselves as a Championship club. I especially want to see City earn a promotion via Wembley and all the excitement that brings. I want to see larger Valley Parade crowds roaring on the team, and for that feeling that we belong in the division we are part of to return – rather than this current unsatisfying state of considering ourselves superior to our league opponents. But more than anything, I want to enjoy watching City. Supporting Bradford City has never been about glory, and as overdue as some success now is such great moments can’t last forever and the regular week-to-week experience has to be enjoyed not endured. That’s why I ultimately don’t want Taylor to manage my club – because the style we play and the enjoyment factor is, to me, perhaps more important than the league table. I’m probably in a minority for thinking this way – football is all about results and, if City were winning most weeks from this style of football, few of us would be complaining. But as I listened to City apparently stick 11 men behind the ball at Oxford and be 11 minutes away from winning, I knew that even if we’d have held out I would not have felt happy about the three points. I guess I just don’t want it this way. Taylor can take City to League One in time, heck he can take us to the Championship eventually. But if the journey there is going to feel this underwhelming and tedious, I’d rather we stopped and dug out the map to find a different route. I want to love watching City again, like I have felt for many years even during difficult times. That desire to go to games as often as possible remains for me – starting with Burton home on Saturday, I’ll be attending all five of City’s matches that will take place in that next fortnight – but these days watching the Bantams is more of a routine than an escape. It’s supposed to be the opposite way round. All of which leaves me feeling and looking a little foolish. For much of the last 11 months I have argued Taylor should have been awarded longer contracts than the club were willing to provide. Yet if they’d have acted on my views, dismissing Taylor now would prove a costlier exercise. All I can say is that the principle of giving managers time to deliver success is, to me, absolutely the right one to uphold. Over the last year the club has focused too much on the short-term and, 13 months on from throwing away the longer-term building work of Stuart McCall, it hasn’t got us any further. It’s time to stop making each season promotion or bust; we have to give the manager – Taylor or whoever – time to get it right. So if you want Taylor to be sacked because of the current league table, I can’t agree with you. Sure the poor results point to a poor manager, but after a decade of utter failure it should be obvious there are no quick fixes and overnight success was always unlikely to occur. Equally I don’t believe sacking Taylor will improve results and enhance our promotion prospects, it will most likely mean taking a step back initially. It’s just I’d rather take that step back and then move forwards if it means we don’t have to endure football as dismal to watch as it has been for most of this season. Despite my views, I won’t be leading the cries of ‘Taylor out’. In fact if that chant is aired on Saturday it’s unlikely I’d join in. Match day should be a time for positive support, no matter how difficult that often can be to muster. My personal views are less important than the efforts of the team to win, and I wouldn’t want to undermine that effort for my own selfish reasons. But unless Taylor returns to the more positive attacking football that we’ve seen in the past – for which he’d quickly receive back my full support , even if results aren’t transformed – I fancy I’ll raise a smile if or when he leaves the club. After so much tedium this season, it will make a rare change. More about League Two, Peter Taylor, Sacking, Supporting, Tactics. Six minutes later the 1-0 lead the Bantams had over Barnet was gone and with it went all of the optimism that came in the week when Peter Taylor turned down Newcastle United. Daley had needed to get working again – he did and came close to an equaliser at 2-1 putting in a good shift all afternoon – but fifteen minutes into the second half the scale of work which he and Gareth Evans on the flanks had to do had not become apparent because for all the six minutes of madness on the pitch it was the fifteen minutes at half time which I believe lost the Bantams the game. Specifically it was the replacement for the injured Tom Adeyemi with new face Mark Cullen and the repositioning of Gareth Evans onto the flank. It was a mistake. That is if one can call a change that fails “a mistake” on the basis that it has failed. Had it succeeded it would have been a “tactical stroke of genius”. It is reverse equifinity in action. Aside from breaking up the attacking partnership which was working well when Peter Taylor made the change to put Evans – ostensibly a striker – into a midfield to replace the more central player Ademeyi he changed the dynamic of City’s engine room. Ademeyi’s instinct to bolster the middle was replaced by Evans’ to attack and as a result the midfield dominance was gone. The win over Bury had shown what could be done with Lee Bullock holding and Ademeyi and David Syers buzzing around and while the different shape against Barnet – back to the 442 – changed the layout of that it had not altered the effect of those three. City were in control of the first half to the extent that the visitors did not enjoy a shot on target in forty five minutes. Recall the successful Manchester United midfield of Ryan Giggs wide, Roy Keane battling with Paul Scholes alongside him and David Beckham on the right. Beckham and Giggs were never mirror imagines and the Englishman always played a tighter role, pulled into the middle, added to the centre. A second Giggs on the right – Andrei Kanchelskis perhaps – changed the balance drastically. In the second half – Adeyemi gone – and the middle two needed the support of one of the two wider players – Daley and Evans – to continue that dominance but both those players were pressing their efforts into attacking. Daley (and Evans) had to work harder because he had to come back into the midfield more as well as continue his forward play. The tip from a three to the two in the middle and the resulting pushing of four into the attacking unit saw too many players put into the position of waiting for play to happen, rather than making it happen. The players could have worked harder but which City fan would have ever suggested the solution to the problem was to give the already working Omar Daley more work to do? Robbie Threlfall on to the left with Luke O’Brien moving forward or Tommy Doherty on with David Syers shifting to the right would have continued the more solid midfield and were options available to Taylor. Rather do that though Peter Taylor – the manager who is famed for defending 1-0 leads – seemed to make a change that wanted more goals. The difference between Taylor’s success and failure was the width of the two posts that City hit – had those chances gone in then no doubt the stuffing would have gone out of Barnet and City’s dominance would not have been questioned – but it did not. It is an irony that – to me – City’s undoing in the game seemed to be in manager Peter Taylor acting against his instinct to defend the one goal lead. He thought Barnet was there for the taking, City almost took them, but not quite. Players cannot always shoot straighter, tackle better and pass more accurately but they can always work hard and it is not wrong for supporters and managers to want that on Saturday or any game but as much as anything the Barnet defeat came from the manager and that manager charging some players on the pitch with the responsibility for too many roles. Ending up with a pair of old fashioned wingers on when we needed (at least one) wide midfielder. The stopped clock is right twice a day. Peter Taylor – like all football managers – is expected to be right all the time. On Saturday – in the final reckoning and from the point of view of the scoreline – he got it wrong. More about Attacking Football, Barnet, Gareth Evans, Mark Cullen, Omar Daley, Peter Taylor, Tactics, Tommy Doherty. How much should we analyse City’s uninspiring win over Stevenage? It was the complete reversal of football’s usual full time etiquette – supporters of the winning team warmly applauding, the losers receiving a mixture of boos and appreciation for at least trying – that encapsulated Saturday’s outcome in all but result. Bradford City may have won the game 1-0, but we home fans trooped out lacking that warm feeling of satisfaction a win usually generates. Meanwhile the Stevenage fans stayed back to afford their players a standing ovation that lasted beyond the emptying of the rest of the stadium. When they did finally depart, their chanting was kept up on Midland Road outside. Any passer-by could only have concluded, from seeing the glum faces of City fans and the smiles of their Stevenage counterparts, that the Football League newcomers had just won the game. As the roads around the stadium clogged up from heavy traffic, City manager Peter Taylor admitted live on BBC Radio Leeds that it had been a poor performance from his team, probably caused by tiredness from the midweek extra time heroics against Nottingham Forest. The listening Huddersfield Town summariser Kieran O’Regan quickly and emphatically rejected Taylor’s explanation, claiming it was too early into the season for fatigue to play a part. And he might be right, perhaps instead Taylor’s squad rotation had more to do with an under-whelming display. There had been seven changes from the team at Shrewsbury to the Forest starting eleven, and a further five changes from that were made for Saturday’s game. Three games in, and already 19 different players have been used. The grumblings that the team played like a bunch of strangers arguably carried some merit. But while a poor performance should largely be tolerated by City fans if it still achieves the desired result of three points, it was the manner of how City played which prompted the most concern. Once Omar Daley had lifted a shot over the bar early in the second half, Boro keeper Chris Day was not even troubled by so much as a wild long range shot into the Kop. City sat back and defended, many players seemingly fearing to cross over the half way line. Were they too tired, shy among each other’s company, or was playing so conservatively the result of quite deliberately and effectively-employed tactics from Taylor? When it became apparent City were just going to defend dourly for the game’s final 30 minutes, restricting visiting attacks to long range efforts, fears began to spread about whether we’d have to become used to this. Ever since he became manager in February, there’s been a Jekyll and Hyde nature to Taylor’s reputation. A strong track record at several clubs provides encouragement he can deliver some belated success to this club, but listen closely to supporters of the teams he’s managed and complaints about boring football are a worrying constant. During the initial 18-game spell last season, we were treated to some exciting and unpredictable football, but on other occasions City played some unappealing and tedious stuff. The final five games of the campaign saw a 4-3-3 formation used to generally-thrilling effect, and the manner in which City battled back to defeat Forest last Tuesday was anything but boring. So which is the real Bradford City, and which is the real Peter Taylor? Perhaps it’s best not to over-analyse Saturday’s events, for the time being at least. It went by almost completely unnoticed, but tagging on the results at the end of last season meant this was a fifth straight win at Valley Parade – a feat not bettered since the promotion-winning side of 1998-99. At this level few teams can play consistently well, and with justification we can perhaps view Saturday’s showing as the type of game we’ve regularly lost over recent years. But Taylor cannot discount the importance of entertaining either. It won’t have escaped Mark Lawn or Julian Rhodes attention that Saturday was – officially at least – City’s lowest league attendance since dropping to League Two level in 2007, and any floating fans present will hardly be rushing back. Those who were there produced an atmosphere both pitiful and wholly embarrassing. To be completely out-sung by barely 200 opposition supporters is a situation we cannot simply allow to continue in the future battles ahead. The question is whether it is the team’s responsibility to provide the fans with the spark to sing or the supporters to lift the players is one we’ll never universally agree on. But if the boos that filled the air at full time deservedly gave Taylor food for thought, the continued chanting of opposition fans as we filed out of the ground gave us fans something to reflect on too. Despite the victory, Valley Parade was not a happy place to be on Saturday. Supporters, management and players all have a responsibility to in future reverse all outcomes but the result. More about Atmosphere, Peter Taylor, Stevenage, Tactics. 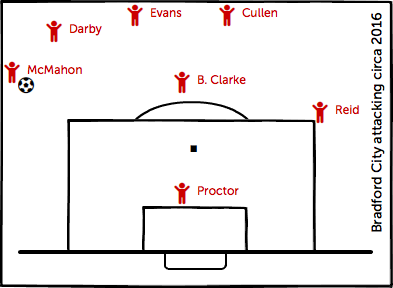 For much of Bradford City’s 2008/09 campaign, I felt frustrated by the number of visiting sides who adopted negative defensive tactics at Valley Parade. It was often nine men behind the ball, very little ambition to even cross the half way line and, most frustratingly of all, too much time-wasting. Although City had a good home record, that almost half the matches ended in draws showed such defensive tactics succeeded too often. But as much as the sight of Chester supporters and players celebrating a 0-0 draw perplexed, the real frustration came from City’s failure to overcome such tactics. As much as we want it to happen, it’s obviously too fanciful to expect opposition teams to set themselves up for a defeat; and if they believed going for a victory against better players was unlikely to succeed, you can’t blame them for taking a point. When City have been higher up the leagues, we’ve often done something similar to others – equally frustrating their players and fans. It’s down to the so-called better team to earn the victory. But it’s a debate that rumbles on. The World Cup is a week old and, after months of over-hype, a collective sigh of disappointment can be heard over the so-far lack of drama. Every competing nation has now played their first game, and for the majority the priority was not to get beat. 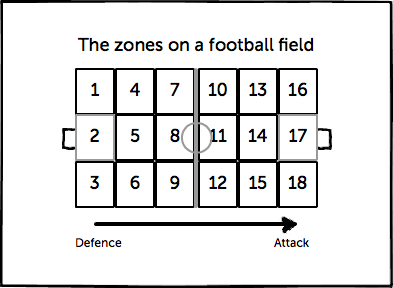 Defensive football has largely dominated, the edge of your seat barely required. Why has this happened? Various theories have been offered ranging from claims there are too many small nations involved who stand no chance of winning, to the intense pressure on managers and players to avoid the indignity of a first round exit breeding negativity. England aren’t the only nation pinning arguably over-optimistic hopes of glory on the shoulders of their team, not everyone can meet their expectations. As we’ve seen with the ridiculous situation of 545 people complaining about Vuvuzela horns to the BBC, the World Cup is widely considered as being more about the TV viewers than those in the stadium or even supporting their team. We want to see Ivory Coast v Portugal for free flowing football and to laugh at either Didier Drogba or Ronaldo finishing on the losing side, which is in contrast to the wants of the two managers trying to plot a win and keep their job. We want to see small nations fit into our stereotypes, look grateful for the chance to be here but then roll over to the flair of the world’s better footballing nations. Not hold on for a dourly-achieved point or respectable narrow defeat. Which is where football as a sport and football as entertainment are at odds. When Chester held onto that draw at Valley Parade in December 2008, 12,000 home supporters went home fed up at their team’s inability to break down weaker opposition and disappointed by the dullness of the occasion. When Paraguay kept men behind the ball and failed to allow Italy the space to play on Monday, we at home struggled to stay awake. Who cares that the 1-1 draw was a great result for Paraguay considering Italy are the best team in the group? New Zealand better be more willing to let them play in the next game. But enjoyment of football should not only be measured by goalmouth action and number of goals. While so much of the focus can be on the spark each team’s star man provides, international football is almost always a team game and it can be fascinating to look at the tactics employed and the approach the opposition takes in endeavouring to overcome them. Don’t just write off a game as “two teams cancelling each out”, at least look at what each is trying to do. Take Germany v Australia, universally considered to be the game of the tournament to date. Australia approached the game like so many other World Cup participants – a very defensive-minded formation designed to frustrate the opposition. Yet Germany passed through them at will, tearing them to shreds even before the task was made easy by Tim Cahill’s sending off. But how Germany did it was the most impressive feature. They played the ball out from the back, knocking it between defenders at a sedate pace. The intention was to encourage Australian players to vacant their position to close down the ball, or just switch off for a second and lose the man they are supposed to be marking. Seeing the chance, a killer ball was played to someone now in space and, as other Australians then rushed to close them down, more room was created for other players to receive a pass. From the sedate beginnings Germany were suddenly playing at the speed of an F1 car, with the move usually resulting in a chance on goal. What was interesting was how, during City’s 2008/09 season, then-manager Stuart McCall tried to get City playing in a similar style against defensive opposition. We often saw Rhys Evans roll the ball out to Matt Clarke or Graeme Lee – usually to screams of abuse from supporters who could not understand what was going on – and the central defenders would keep knocking it around until an opposition player tried to close them down. Space vacated, the opportunity to play through them. It didn’t work as well as Germany of course – we don’t have the players and the narrow Valley Parade pitch suits teams who want to pack the midfield – but it did grind out a few wins that were looking as though they were going to be draws. Although the other side of the coin that season was the naivety of upholding attack-minded principles on the road; most explicitly seen at Notts County, where the home side’s counter attack tactics saw them take advantage of too many away shirts bombing forward by scoring three first half goals from only three first half attacks. McCall later admitted he should have been more prepared to approach away games with the view that a point would be a good return; and with City narrowly missing out on a play off spot, it’s questionable whether they came up short due to regularly failing to get the better of defensive-minded visiting teams at home, or because McCall did not try to play in a more similar manner on the road. Similarly a lesser nation in the World Cup is not going to go all out attack against teams with pacy players who thrive on space, as they would be embarrassed too. As the new season slowly begins to feel closer than the end of the last one, it will be interesting to see if Peter Taylor does a better job of finding the balance. His track record and initial 18-game spell in charge last season suggests there won’t be a lot of high scoring games. City did not have a great season on the road last year, and it’s reasonable to assume taking a point from visits to some of the better League Two sides will often be accepted by Taylor. Nor indeed is it clear whether City will have the attacking nous to overcome visiting teams playing more defensive-minded. Such tactics were rarely employed by visitors last season – a clear indication of League Two’s lesser view of us – but may be a regular feature again this season if City start well. We know City will be organised and disciplined under Taylor, but what flair there is more likely to be displayed in the ability of Tommy Doherty’s passing rather than wingers tearing full backs apart. Much may rest on finding a goalscorer this summer. But even if we do endure a few 0-0s, they surely won’t be as bad as some of the early World Cup games. The three game group stage makes any loss in the first two matches near-terminal to a team’s chances, and it’s understandable why the incentive of not losing is greater than risking a win. For now let the commentators, pundits and armchair viewers complain. The sight of New Zealand celebrating a draw may not be anyone’s cup of tea, but for City fans it’s a more enjoyable sight than opposition teams celebrating the same result at Valley Parade. More about Peter Taylor, Stuart McCall, Tactics, Tommy Doherty, World Cup 2010. Touch wood, everyone will be starting the new campaign equal. Last season’s League Two saw a whopping 74 points collectively deducted from four teams, with the result a less competitive and more conservative division. With Luton beginning on minus 30 and Bournemouth and Rotherham minus 17, you had to be really bad to become embroiled in the relegation battle. Two clubs – Grimsby and Chester – were, thanks largely to some wretched winless runs. The latter getting relegated with Luton, who never really stood a chance. But what of the rest? There were around 10 League Two clubs with little to play for last season. No where near good enough for promotion, but no where near bad enough to throw away such a sizeable headstart that relegation worries were anything stronger than faint. It was a campaign for going through the motions. The downside, on Valley Parade evidence, was how good a result an away draw was thus considered and we had to become used to visiting team after visiting team playing either five at the back or five in midfield. Compare Macclesfield Town’s – the perfect example of a club able to coast through a nothing season – approach at Valley Parade last March to that of relegation-threatened Mansfield and Dagenham the March before. City’s home record may have been better last season, but few opposition teams turned up to BD8 with ambitions of testing it. No player seemed to suffer more from this than Michael Boulding, who’s first season in Claret and Amber can be politely described as disappointing. It became quickly obvious that Boulding was a player who likes to run the channels and receive the ball at his feet, but the deep defensive tactics of opposing teams meant the space to do so was minimal. In too many home games Boulding was anonymous, rarely touching the ball never mind threatening to score. Away from home he wasn’t always on his game, but the increased space afforded by home teams more prepared to take the game to City meant he was a more notable threat. He ended the season with 13 goals – but hasn’t scored at Valley Parade since December 2008. The affect of these opposition defensive strategies meant the kind of football the majority of City fans like to see wasn’t always possible, and over time the myth has grown that manager Stuart McCall likes his teams to play ‘hoof ball’. It’s true to a point that City have become more direct under Stuart compared to the style that predecessors Colin Todd and Nicky Law, for example, liked to play, but the chances of City getting through a sea of opposition players parked resolutely in front of their keeper makes the success of short patient passes manifesting into goalscoring chances limited. Get it into the opposition’s final third, even if it’s not by the prettiest of means, and the opportunities to get closer to goal increase. During a season where there was endless debates about no Plan B, it would be wrong to say this was all City tried. It appeared they went for a mixed style with the ball passed around some times, then targeted down the wing at others, with direct attacks another weapon. Play the same way all the time and, against defensive-minded opposition, it becomes too predictable. Some of City’s better moments certainly came through quick-fire passing and, when in form, were an exciting team to watch. ‘Hoof ball’ really came to the fore during the poor run of form in March, which showed it was a sign of drained confidence. Players are less likely to try the patient approach when people in the stands are screaming “forward!” and ready to chant “you’re not fit to wear a shirt” at the first sign of problems, so our necks began to feel the strain from all those ‘hoof balls’ during the increasingly desperate run-in. Stuart needs players with certain qualities to take the club forward this season, the conviction to play to your strengths and take ownership of situations, even when low on confidence, being high up there. Easier said than done with League Two calibre players though. Which brings us back to Boulding, who has today revealed he wants to stay and prove himself after last season’s disappointment. Whether opposition teams – more likely to go into matches targeting a win with a proper relegation and promotion battle – change their defensive approach this season remains to be seen. However for Boulding to succeed he’s going to have to show more in his game. Unlike at his former club Mansfield, where he was the star, this City team is not going to be built around him. He faces a battle just to make the starting eleven ahead of Peter Thorne and Gareth Evans. It’s not going to be enough for him to have long anonymous spells in games and to wait for the team to play him the right ball, he has to come looking for it and to be more determined to influence games. There’s no doubting Boulding is a good player and City remain fortunate to have him. In a division that should be more adventurous and competitive this season, he needs to follow suit. More about 2008/2009, 2009/2010, League Two, Michael Boulding, Stuart McCall, Tactics. When Barry Conlon checked back to see it the header that gave City a 1-0 win over Bury we all checked back a month or so to when City were in trouble. Back then Barry was getting booed and City were on the way out of the promotion picture. The reason for this was Stuart McCall who was tactically naive or he lacked a plan B or both. The jungle drums that beat were against him but sound distant now. McCall was never the hapless legend afforded a job above his talents that his detractors would have him portrayed but neither does he have a Midas touch either. Sometimes he gets things right and sometimes he does not and it seems that the former out weigh the latter. McCall suffers as all managers do from the wisdom of crowds where broad judgements are given to fine situations. It is very much a tool in the modern arsenal of a manager to be able to filter the signal from the massive noise that pervades every decision one makes. McCall’s continued use of Conlon shows this skill is growing in the City boss. The manager wants Barry in the squad but not the side and while backing him to beat boos and be useful he is careful not to overplay his importance at the expense of his plans for Michael Boulding. McCall does the same with TJ Moncur who’s presence in the side over Paul Arnison is a mystery to me but not to the manager who ultimately is charged with maintaining cold judgement when all around are dealing in hyperbole. The calls for Barry to start will increase but Stuart must keep his own council on the hard working, prolific Boulding despite the noises around him and the emotion of Conlon, Willy Topp et al. Perhaps one day McCall will join a club where if need not worry about damaging his legend status – his comments at City have shown on occasion an impressive willingness to wield the power he has – and his relationship with supporters will differ. Then he may be aggressive as well full throated in his defence of a Conlon but for now he has the lesson of filtering out all except performance and the justification that comes with winning. Now the manager faces a different set of tests with Joe Colbeck out for two months and the continued motivation of Omar Daley now paramount but those tasks begin from second in the division. Plan B? Tactics? Barry Conlon? Everything becomes right with a win. More about 2008/2009, Barry Conlon, Michael Boulding, Paul Arnison, Stuart McCall, Tactics, TJ Moncur. At twenty five to five this report was going to be very different. At twenty five to five the report was going to centre around Bradford City and the October curse but at quarter to five Peter Thorne completed an amazing come back and the report had been turned on its head. Our record in October over recent seasons has not been good last year we played 5, lost 3 and drew two. The year before played 4, lost 3, drew 1. Going into the last ten minutes today with confidence obviously low it looked as though this year would read played 2, lost 1, drawn 1. However thanks to an inspired performance from the player, who was the focus of what is becoming known as ‘boogate’, defeat was avoided and Bradford are sitting pretty in the automatic promotion spots. Bradford set up like they do for all home games in a 442, Nix predictably came in for Omar Daley who was on duty with Jamaica, Luke O’Brien replaced the suspended Paul Heckingbottom, and TJ Moncur returned to the side in place of Ainge despite him doing a more than capable job against Luton. For much of the first half Bradford dominated possession without creating much but were more than comfortable with an Accrington side who didn’t look in any danger of breaking the deadlock. The Bradford fans locked out of the ground despite having tickets weren’t missing much of a spectacle. On the same day that Lampard and Gerrard were being reunited for England and consequently sparking the usual debate of whether they can play together, Bradford seemed to be suffering from the same problem with their two talented central midfielders, MacLaren and Furman. Where as Lampard and Gerrard both like to push on and get up with the strikers leaving a hole behind them in front of the defence, MacLaren and Thurman both like to lie deep in the midfield leaving a gap just behind the strikers. Consequently any ball knocked down from Bradford’s front two was not contested and simply picked up by the Accrington players, who would soon easily give possession back to Bradford. It seemed as though this pattern would continue until changes were made. Then 20 minutes into the game Accrington won a corner and a few nerves seemed to enter the Bradford players as they shakily defended the corner and eventually scrambled it out for a second corner. Again the corner wasn’t dealt with in the most sure manner and as the ball went out for a third corner an air of tension seemed to be gripping the strong Bradford following. The third corner saw Bradford punished by a move they themselves have used to good effect as the corner got sprayed to the edge of the box which was dummied by one and placed into the bottom corner past Rhys Evans by the onrushing James Ryan. Out of nowhere Bradford found themselves a goal down having once again been punished for the slack marking which has been evident over recent weeks. Fortunately this seemed to spark life into the men wearing claret and amber and the tempo of the game picked up as they began to turn the screw. Minutes later Nix brilliantly switched the ball from left to right in a well worked move that found its way to Thorne on the edge of the box but City’s red hot striker just pulled the ball wide of the post with the chance that nine times out of ten he would have nestled in the bottom corner. It was the Bradford youngsters who seemed to be stepping up to the plate, Furman was battling away and still keeping composure with the ball at his feet, while Luke O’Brien was bombing on from full back to give Nix the over lap and create the extra attacking threat. This threat was probably more effective due to absence of Daley purely because any full back would struggle to catch the Bradford speed merchant never mind overlap him. City continued to look for the equaliser as the first half wore on and were extremely unfortunate to have a goal ruled out for offside just after the half hour mark. A lovely weighted free kick found its way to Graeme Lee and Lee cleverly nodded the ball down to Thorne who did find the net on this occasion only to see the linesman flagging. Somehow he had seen Lee to be offside when the free kick was taken. As the half wore on frustrations began to show and Colbeck was booked for dissent by the referee, Mr. Jones, who was handling the game very well. It was the referee giving another free kick Bradford’s way that led to the best and final chance of the first half. A Colbeck free kick caught a deflection off the wall onto the bar and the rebound fell to Michael Boulding with an open goal gaping. However, the ball bounced away from the player who couldn’t get his head far enough around the ball to direct it into the net. The mood at half time was neither upbeat nor low, although some were annoyed the Accrington catering staff were unable to cope with the big crowd and although it has been denied that Windass will return rumours may reappear because someone had eaten all the pies! After the break the players returned to positive reception as the crowd certainly didn’t think this game was beyond Bradford yet. Unfortunately this mood lasted no more than 5 minutes as Terry Gornell playing in only his third game on loan from Tranmere slipped all too easily in between Bradfords two centre halves and an exquisitely played through ball found him one on one with Evans and the youngster slipped the ball between the former Chelsea keepers legs. Now Bradford found themselves with a mountain to climb. The goal seemed to zap the confidence from the players and the effort seemed to have gone too. I was soon worrying about what I would be able to put in this report as for the next half hour nothing appeared to happen. Gornell still worried the City defence with his movement but Bradford could no longer seem to put anything together themselves. Numerous times Rhys Evans rolled the ball to the disappointing TJ Moncur who proceeded to just lump the ball back to Accrington side. This seemed to happen with almost every possession Bradford had and made the exclusion of Ainge seem even more unfair. After the game McCall would say in an interview about how he worried about the lack of leadership on the field and this was certainly evident as the 11 players went completely quiet with no communication apparent. With around 20 minutes left McCall resorted to his much criticised ‘plan b’. Barry Conlon had warmed up and stripped off and everyone waited to see what reaction the travelling Bradford contingent would give the big striker. I admit that I have been one of Barry’s biggest critics in the time he’s been with the club but would never go to the extent of booing him. I have never seen what he offers and have even labelled him lazy despite the majority appearing to think he gives 110%. I have often thought he doesn’t compete for headers and falls over to easy for a big lad. My disappointment was further enhanced by the fact the player he was replacing, Kyle Nix, is a player who’s cause I have championed on many occasions and a player I feel always likely to get a goal when played down the middle. To be fair Nix had not had his best game off he came with Boulding taking his place out wide. 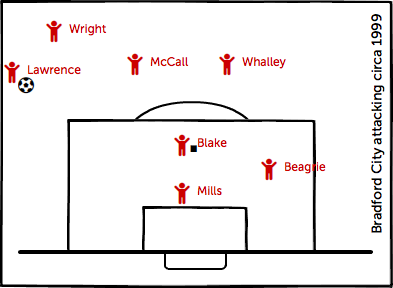 The 442 was retained but the wingers were pushed further forward as Stuart tried to find a way back into the game. For his first ten minutes on the field of this game Barry did nothing to change my negative view of him, that however was soon to change. With ten minutes to go and Bradford looking like making it 1 point from 12 another long punt was launched up the field. A punt which before would of been won by the Accrington defence was brought down by ‘Big Baz’ and neatly laid off into Boulding’s path who struck it first time into the underside of the bar and down into the net. Suddenly Bradford felt they may get a point after all and no more so than Barry who was all over the place. Winning the ball in his own half and spraying perfectly into the channels, winning balls in the opponents half and knocking it to players wearing claret and amber. Something the rest of the side had struggled with for much of the second half. Two minutes from the end Conlon found the ball coming his direction inside the box and for once his leap saw him rise above everyone else and he directed a header into the back of the net. For the second game in a row he had come off the bench to score and if he wants to stop the boo boys then he can do no more than find the net regularly. Accrington were on the rocks and Bradford were now wanting blood. Less than 60 seconds from the restart they worked their way into the Accrington half and Bradford fans had barely had time to catch their breath before the ball was slid into prolific Peter Thorne’s path and there was no doubt about where the ball would finish. Thorne thumped the ball home to complete an amazing Bradford comeback that had been unthinkable just ten minutes before. The relief and joy was evident in the stands as the fans went wild and some idiots even charged onto the pitch, hopefully no repercussions will follow for the club from these actions. The shocked Accrington players threw men forward in vain even keeper Kenny Arthur appearing in the Bradford box for a late corner but City hung on and the three points ended up somehow crossing the border from Lancashire to see Bradford climb back into the 3 automatic promotion places. However the result certainly did not tell the whole story and it was obvious from Stuart’s face at the final whistle that he was less than impressed with the overall display. Still it is about time the gloom merchants at Bradford began to look on the bright side and we go into the Gillingham game only a win away from top spot and the curse of October ended. More about 2008/2009, Accrington Stanley, Barry Conlon, Graeme Lee, Kyle Nix, Michael Boulding, Peter Thorne, Stuart McCall, Tactics, TJ Moncur.